Possibly the best-named geek-up in history, Geek Ninja Battle Night made its debut on Friday night. Essentially it was a mini-conference, managing to pack talks, debate and a social into a few hours and a relatively intimate space. This particular evening focused on the issue of what’s better for mobile users — a mobile-optimised web app that works cross-platform; or a focused, dedicated native app. The speakers and attendees were split into two camps — Team Web and Team Native. After being greeted at the door by the enthusiastic and friendly host Aral, we hit the bar to take advantage of the free drink token (thanks!) 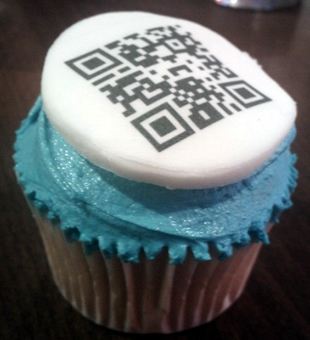 and grab one of the intriguing QR cupcakes, before settling down to see Andy Clarke and Remy Sharp of Team Web pitch their case. Andy was first up and explained his view that there should be separation between device and data. He used his collection of Zip disks (remember those?) as an example — he had to buy a drive on eBay, but if he hadn’t been able to read the disks, the data on them would have been lost. In contrast, something that is on the web should always be accessible — unless something unusual happens like the ma.gnolia crash or the BBC’s “archiving” of older sites. Andy also introduced the idea that device-specific designs risk “ghettoising” users as older devices fall out of favour and no longer receive new features or updates, whereas something that works now on the web should continue to work for all users with capable devices. He wrapped up with the notion that the best solution is not about the technology, rather it should be about what is most appropriate for your audience and what you want to achieve — something that was echoed by all the speakers. After a short break for drinks and cupcakes, it was the turn of Team Native. These guys arguably had a harder task in a room dominated by the blue badges of Team Web (at least, as far as I could see). But the pairing of Sarah Parmenter and Aral Balkan was a strong one and they refused to be intimidated. Having enjoyed Sarah’s talk at New Adventures I was interested to see her talk about why she prefers designing for iOS over designing for the web. She explained that designing native apps gives you more control over the display of your app, which means you can tailor the design more. She feels that the constraints of designing for a smaller, fixed-size screen can actually help the design process, by forcing you to focus on the few most important things your audience will want from the app. One soundbite that particularly stuck with me was that if you try to design for all devices, you actually end up not designing particularly well for any device — it’s better to come up with a focused product than to hedge your bets. It reminded me of the Russian proverb “chase two rabbits, catch none”, which seems apt. Last up was host, experienced speaker/teacher and successful iOS developer Aral. Aral’s talk was probably my favourite of the night for his sheer exuberance and clear passion for the subject. Like Sarah, he extolled the virtues of having your app “working well” on one device rather than “kinda working” on multiple devices. He also talked about the differences between device reach and user reach — backed up by the recent figures from Apple that they have 200 million user accounts with a one-tap purchase capability. In an ecosystem where monetization is something even people like Twitter have struggled with, this is a big plus — if you can get featured on the App Store or Android Market, you will get a lot of exposure. Aral also discussed the notion that “best to market” rather than “first to market” will bring more success in the long term. The idea being that if you rush out a web app for iOS, Android and Blackberry, all is well while you’re the only choice — but once the dedicated apps come along and give a better, more focused experience, you’ll lose market share. Overall, I thought Aral’s talk was the perfect wrap-up before the debate session. After another quick drinks break, the speakers took to the stage again to field questions from the audience. This gave the speakers a chance to clarify some of the subjects they had touched upon and the audience provided some good questions. Remy and Andy in particular seemed to relish the format, not pulling any punches and making a strong case for Team Web. Personally I think it would be interesting to expand the debate format and let the speakers try to argue and counter-argue the points raised in their talks, like politicians do. Perhaps the main talks would need to be cut down a little to accommodate but it would certainly have been entertaining to watch. Once the debate was done there was time for a quick social — most people formed small groups and discussed the issues raised over a drink and a cupcake which was a pleasant way to end the evening before hopping back in the car with Ant for the short drive back to London. Overall, Geek Ninja Battle Night seemed to be a roaring success — not a spare seat in the house and a well-informed, receptive audience combined with passionate and knowledgeable speakers made for an evening well-spent, with plenty of food for thought from both camps. I also got to meet Stu and Chris which was a pleasure. I’ll be keeping a sharp eye out for news of the next Geek Ninja Battle Night and so should you — tickets for these events will be like gold dust. Posted on Tuesday, 15th March 2011. Fantastic article Kris! Nicely written and a great recap of a great night! I’ll be checking out the rest of your site and your work now! Keep in touch. Thanks guys - good hanging out with you! @Chris - yeah, to be honest Aral got me really excited about building something native which I didn’t expect. If I can spare the time/cash I’d love to go on one of his courses, I think he’d be an awesome teacher.